The final part of our Journey began as we rolled into Eugene and on to the site of FaerieWorlds. For our little troupe it felt more like a homecoming than the start of a festival. With some help from the fae we were able to roll the wagon off the trailer and started to set up. The comedy started right away as I weaved the van and trailer through the trees to find the right place for the stage. I was missing trees by inches on either side but after about 30 attempts finally had it where we wanted it. We had lots of help in the form of Ellen and Troy Ulmer as we put the stages and tent up. I had to dig a small ditch in the side of the hill to get the trailer and “soon to be stage platform” to sit more level. All in all it went up pretty quickly and we were set up in a few hours. The comedy continued the Next morning as I went down to NeverWorlds by myself trying to figure out the best place for the gypsy wagon to live all weekend. A spot were it was visible for people passing by and a quick exit from NeverWorlds. Despite it’s weight the wagon rolls pretty easily. Big wheels certainly help. So there I was, pretending to be a horse, and pulling the wagon by the shafts up a small incline. Right as I reached the top my Sandals slipped on the new hay and my feet shot out directly behind me. I did an instant face-plant into the ground. Adding insult to the thumb crunching injury I just felt, the cart started to roll backward dragging me about 6 inches before I bounded up. I looked around quickly, as one does in these situations, to see if anyone saw my ego bruising fall. No one was in sight. Phewwwww. The thumb on my left hand howled in protest. “good thing it isn’t my Nymbol hand” I said in my head and then laughed at the absurdity of both the accident and the comment. I went back to the tent, iced my thumb, and got ready for the day. An hour before our first show of the day one of our favorite people in the world came by and dropped off her sound equipment for us to borrow. Now if we could just figure out the power thing. This year the county brought electricity directly into the park and had it running underground to a junction box not 150 feet away. The electricians were out there in the morning so I peeked over their shoulder as they started to lay out all the “spiderboxes” for the faire. On their little diagram I noticed there was no power heading into NeverWorlds. We had been forgotten and somehow would use magic to power our sound system. The solution to this was that we were allowed to plug directly in the box from our area. Not the big plugs but the teensie weensie ones hidden under the board. Fortunately, Matt Hawk brought a 150 foot long power cord. After daisy chaining about 6 cords with powerstrips together and blowing the fuse twice we were stable enough to start our first show of the day. 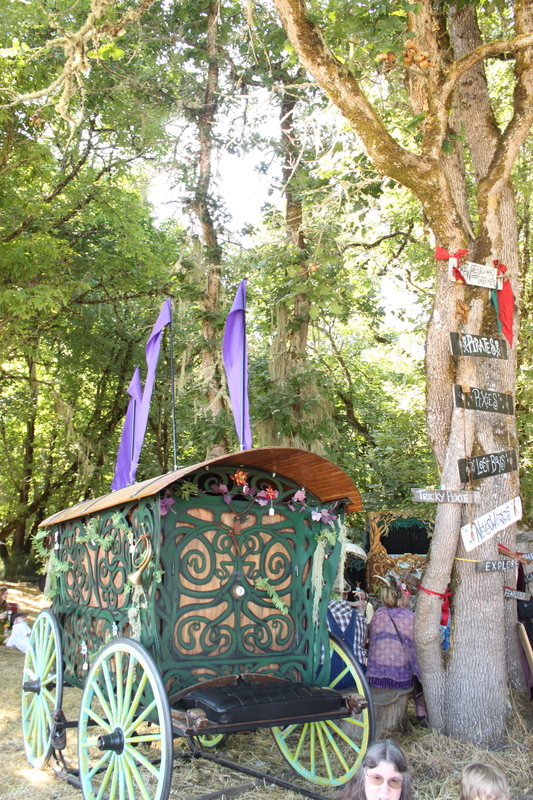 It was a little rough around the edges but we blasted out the cobwebs out and our FaerieWorlds had officially started. If nothing more the good-sized crowd seemed to like Rob Marsanyi’s awesome accompaniment, so we thanked them and quickly headed to grab something to drink before the Opening ceremony began. The opening ceremony at FaerieWorlds is always lots of fun but you must have a wee bit of patience. The crowd is huge and the phrase “herding cats” comes to mind as Emilio, Robert, and Kelly welcome everyone and create an amoeba shaped circle in front of the stage of 500 or more faerie clad revelers. Being near the stage Sam and I got a front row view for Donovan’s first appearance of the weekend. After the procession he and his lovely wife of many years lit the candles on the beautiful alter that sits in front of the stage. It was now time for the Spiral dance. SJ Tucker joined in as Woodland began to play and the spiral began. This is soooooooo much fun and the sheer joy of it just bubbles to the surface of everyone in line. If there is a single transformative moment in this festival for me, it is this dance. Our inner Faerie Imp is released and doesn’t leave for weeks after we are home again. We then watched, laughed and danced as Tricky Pixie really got mainstage rolling. The band’s fans are another wonderful show on their own as they gyrate, tango, hoot, holler, juggle and spin thru the set. After the show and a little food we all headed back to NeverWorlds and got the wagon ready to roll. Nymbol driving at the front, Serriffina at the back. Our human ponies Mad Matt and Caelen pulled the cart onto the path and we rolled slowly and engaged fair goers and vendors alike. It was lots of fun and Nymbol made some new friends and other folks took pictures, laughed and walked along with us. The only downer moment was when some Hawaiian shirt clad “dude” with cell phone to his ear walked right into us. Do we need to pass a law on that too. I had to slam on the brake and even though we were going about half a mile an hour it was enough of a lurch that Serriffina yelled something at me I cannot write here. We were only out for about an hour but we were all plenty tired by the time we got back to NeverWorlds. Highlight number one of our weekend came on Friday night. At Midnight we sent all the kids to bed and had a “secret” gathering of singers and performers at NeverWorlds. Nymbol Emceed as a number of wonderful special guests sang songs, did skits, performed strong man acts and Burlesqued their way into the night. “Red” made his first appearance with Nymbol and neither one will ever be the same again. We are so doing that again next year. Thank you SJ, Betsy, Jeremy, Mad Matt, Ryan, Serriffina, Nymphaea and of course, JADE! Highlight number two of the weekend came Saturday Night. At midnight Nymbol was hiding from Wotan as his image and voice were projected on to the Main Stage. It was a bit of a rough start as there were some “technical difficulties” but that is a whole other story. At this point I have to say that Caven and Nichole Keith are Rockstars. Caven shot Nymbol and made him look great in the steady, drama free, professionalism we have come to rely on. Nichole shot up the rickety ladder and manned the Pizza Box that was used to shut down the image while the acts came on. Nymbol had a ball, loved being so huge, and much to everyone’s surprise sang a song all by himself. The moment for him is when he got the crowd to “Ohm” just like the Mystics in The Dark Crystal. Unfortunately, Wotan ultimately found Nymbol’s hiding place, bonked him on the head and roared at the camera and crowd. I heard it was truly frightening. I Can’t wait to do it again next year. Our Final highlight of the weekend was our show on Sunday. All the cobwebs were out by now and our show flew by. One of the best we have ever done and it was a great crowd too. Nymbol and Blarney were on fire regaling the crowd with “Nymbol’s Secret Ride.” Blarney managed to sneak in a new line about being probed by aliens and had Nymbol shaking his head in amazement while laughing. Blarney (aka 10-year-old Izzy) stole the show. It was a little sad to sing our goodbye song as we realized our performances were finished but we had such a great time. I sincerely hope that everyone had even a fraction of the fun watching our shows as we did doing them. Our Final, Final highlight of the weekend was clearing the Nymbol stage and creating an instant Pirate Ship for SJ Tucker and her band of Players to sing and act out the first two parts of the Wendy Trilogy. Tabatha Cass got to play Wendy and Jeremy Bloom brought his own magic to Captain Hook. The assembled crowd got quite a treat. A great way to end our favorite FaerieWorlds yet. Some Nymbol Thank You’s………….only if your interested. Rob and Shelly Marsanyi for making the long drive down to be part of Nymbol’s Troupe. Rob’s natural inner child comes out and he plays with unabashed joy. It is blessed to have you bang the keys along with Nymbol’s ramblings. Thank you Shelly for taking photos during the show and being another set of ears and eyes. We need that. Caven and Nichole Keith. You guys are so much fun and bring our meager little troupe to a whole new level. It is not that you just make us look stunning on video, we depend on your skills, expertise and steadiness to keep us moving forward. Not to mention being good friends. Jade. What a wonderful addition to Nymbol’s midnight show. I know it was the first time we did one, but I couldn’t imagine it without you. Certainly the most applause, hoots and hollers of any of our shows. The nicest Darriere in the troupe. Caelen. From Junior Goblin to Flying Rat Boy you share your skill, talent, boyish devilishness and pure fun with the troupe and public. You are a Rare Jem. Thank you for being part of our little troupe. Aloria. Aside from birthing Caelen and shaping him into the wonderful young man he is. Thanks for running the booth, always being prepared and your skill with material and a sewing machine. You are our own Nymbol version of Mary Poppin’s and her wonderful carpet-bag. Mad Matt. The longest standing member (double entendre) of Nymbol’s Troupe. You give our show that edgy Circus flair we need and we are so happy you share your many talents with us. From scaring kids with whips, candy cannons, and your honed skills with power tools, wood and a ruler,… We couldn’t do it without you. Our Faerie volunteer Troy and Ellen Ulmer. You guys are awesome, soooo helpful and took good care of us. Serriffina’s light up wings are beautiful. We can’t thank you enough. Sj Tucker, Ryan and Betsy. Thank you all for befriending our Troupe, family and giving so freely of your talent to shine a brighter light on what we are doing. We appreciate that more than words can express. Matt Hawk and Kesha. Love you guys and your friendship means a great deal to us and we appreciate you having allowed us to play in your world. Congratulations on your news. We are excited for you. Kesha you create magic with your camera. Jan and Deb. For being the most spectacular grandmother, mother-in-law, mom and auntie one could possibly imagine. Thanks for being part of the adventure. Wotan (Eric Pope) You add soooooo much to our shows through with your Giant Hammer and Personality. A very fun element of danger and surprise. Nymbol wanted me to say,…Phhhhhllllltttttt. The Wild Hunt,… thanks for totally creeping us out and scaring little kids along with Nymbol. Nymbol wants me to add there isn’t as much meat on him as there is on Mark Lewis. Kelly, Emilio and Robert. What a fantastic event you have created. Thanks for letting us be part of it. It has changed our lives. And Finally Siobhan and Keith. Our own roller skating bad faerie and her husband and drummer extraordinaire. I know you weren’t at FaerieWorlds this year because Keith was sick but we thought about you every day and wished you could be there with us. Now more than ever. Keith, we will miss you. You are in our hearts forever. Glad you liked it. Hope to see y’all sometime here on the island.